Do you feel overwhelmed at the thought of laundry day? Does it seem like it has been months since you have seen the bottom of your laundry hamper? Well, you are not alone. Doing laundry can be a daunting task but if you find a routine that works well for your family it will make the chore more manageable and efficient! It may take some time and effort on the front end, but it is sure to make a difference in the long run. One tip to make your laundry life easier is to get your kids involved. They may not be old enough to operate the washer and dryer by themselves, but they can do their part. Kid's clothes can get out of control so quickly – especially if they wear school clothes, sports clothes and play clothes all in the same day! Therefore, it is important to designate a place in each child's room for dirty laundry and make sure they know where that spot is! 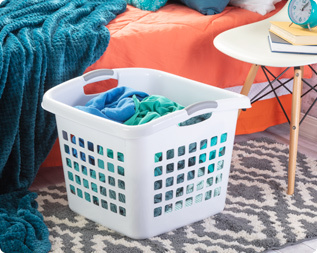 Sterilite's 1.75 Bushel Ultra™ Laundry Basket is perfect for this. The square design makes it easy for children of any age to carry, while not taking up too much floor space when in the bedroom. Get your kids in the routine of putting their dirty laundry in the basket, and not on the floor. More importantly, make sure they get their clothes "laundry room ready" before putting them in the basket. Once the basket is full, the kids can bring their dirty clothes to the laundry room. Below is a list of steps on how to get clothes "laundry room ready." A key element in controlling and maintaining the laundry process is to develop a system for sorting the clothes, both before and after washing. You want to ensure that your system is orderly and easy to follow. Sterilite's Weave Laundry Hampers can help with this! Create a sorting station in the laundry room utilizing three hampers, designating one for darks, lights, and colors. When each family member brings in their basket of dirty clothes, they can sort them into the appropriate hampers then store their basket away in the corner. 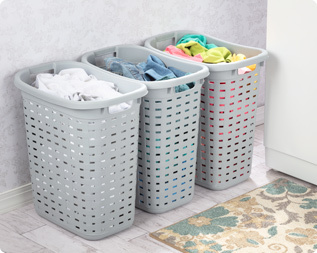 The laundry baskets fit efficiently inside one another, saving valuable space in the laundry room. Once you have washed and dried all of the clothes, sort them back into the laundry baskets for each kid to bring back to their room where they can fold and put away their clean clothing. This will save you time and effort on laundry day! It will also help instill good laundry habits in your kids at a young age. To have a functioning laundry system, you cannot forget about the details. Doing laundry will be quicker and easier if your supplies are well organized and easy to find. To keep a coordinated look in your laundry room, try utilizing our Weave Baskets. They will match perfectly with your hampers. 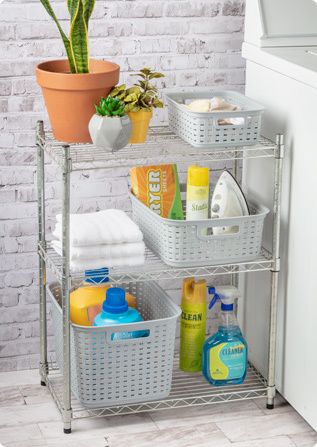 Our Tall Weave Basket is ideal for storing your larger items such as laundry detergent and fabric softener. Try containing your smaller laundry items such as dryer sheets, lint rollers, and ironing supplies in the Short Weave Basket. If your socks are frequently separated when doing laundry, try using our Small Weave Basket as a temporary home. When the matching sock makes its way through the wash, it will be easy to pair them up. Not only will your laundry room be organized, it will be stylish too. Laundry is a never-ending chore, but with a sound system and some help from your family, it will be a little more manageable! Get your kids in the routine of putting their dirty laundry in the basket, not on the floor. This sorting station will make laundry day more organized and efficient. Weave Baskets will add a fashionable touch to any laundry room.